My friend Lynz prompted me to make a blog entry about how to do "swoopy" machine quilting. I was inspired to try this when I saw a small quilt done by a lady named Krommama, over at Flickr. 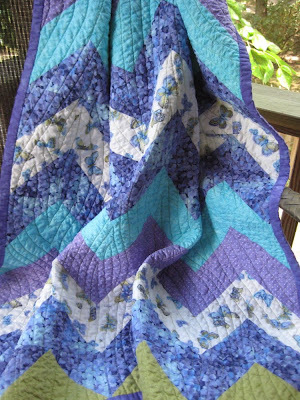 I studied her quilt for a bit and then just went for it on my little zigzag quilt, the Blue Morpho. It came out really nicely so I did it again on the Amethyst Matrix, a companion piece which resides right next to the first one, on the bed, under a cat or two. Since they would be side-by-side, I wanted the quilts to have a lot of things in common- the colors/fabrics, the quilting, and the size. One major note- I did this style quilting on these quilts first- these measure about 40 x 48" and it was pretty easy to do the quilting. Then I did a bigger quilt and it was NOT so easy to do, because of all the turning involved. I spent more time and energy wadding the quilt up and shoving it thru the small throat of my machine until I was about ready to scream. That quilt was about 70 x 84" and it was actually easier to work on the middle of the quilt instead of the edges, which was a shock to me, I've always disliked doing the middle before. So take my word for it, please and save yourself some aggravation. The smaller the quilt, the better for this style of quilting. So to begin, I drew it out roughly on some paper just to give me an idea of where to start, but I didn't draw anything on the actual quilt sandwich which was basted together with pins. Use your walking foot if you have one, it makes things so much easier! I stitched a few main lines on the quilt.A couple of them go all the way from the top to the bottom, others don't, but you need to put some in there to keep things together nicely and to give yourself something to work off of as you continue stitching, a guide if you will. Then you start filling in the blank places. I start out stitching with my lines about an inch apart but it varies here and there. There's a lot of turning in this quilt, except for those long, straight lines. Having a "needle down" position is really helpful and makes it a lot easier. Stop and ponder it every now and then, make sure you're getting the effect you want and aren't stitching yourself into a corner. 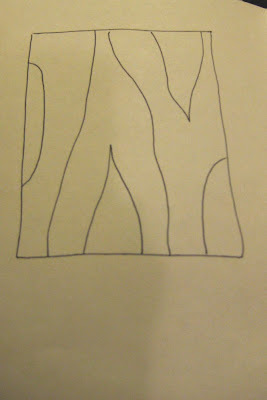 Take it out and lay it on the floor, squint at it and try to picture what you want and where you want it. It won't take you long to realize how fun this is! 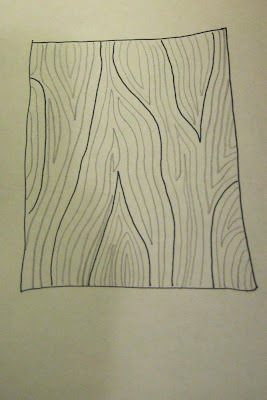 You can do knot holes, wood grain, butterfly wings, etc. 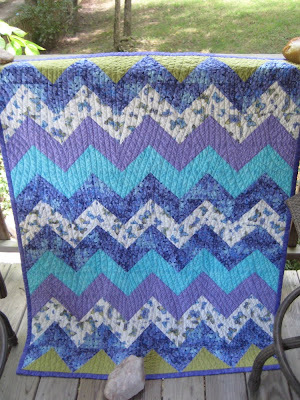 All kinds of lines work well and you can do all of them in one quilt. I have this posted at Flickr, too, on my photostream. You might get more info there in amongst the other questions asked and answered. I recommend reading that post and checking out the note. Have fun doing this, once you get a little confident, you can get really creative with it. And here you can see where Lynz did it on her swappy Christmas quilt! Thanks so much Flamey (Flossie) ~LOL~!! Anyway, thank you so much for showing how you do this wonderful design! I'm going to use it on my next quilt!! Hehe - word verification is qualito!! this is what i love about the quilt blog community...there is always something new to learn and be inspired by. 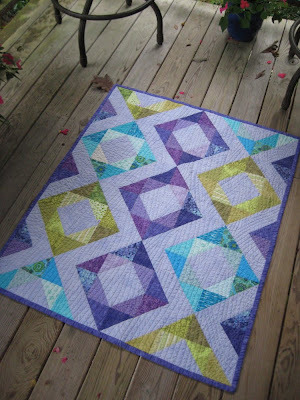 this quilting is such a great idea...i love it and i love even more that it uses a walking foot. so much easier for me. The quilting technique is so neat and as usual you did a beautiful job. Love your blog. You don't have to answer my comments, just stay at the sewing machine and do what you do best. Love, Vique (KT) P.S. I don't know what all those profiles are for. So, I picked anonymous even though I signed my name duh. I never said I was smart. I love this! I'm going to try it. I want to thank you for the inspiration on quilting. I follow you on Old Red Barn Quilt a long too. Anyway I made a lap quilt for my Mom and used this type of quilting I did large swirls and swoops.I am so happy with it. Can't post pics anywhere, I'm afraid my mom will see them. but after Christmas I will post on my blog. Thanks again for your inspiration! I think I'll give this a try very soon. I love the way it looks on that quilt!